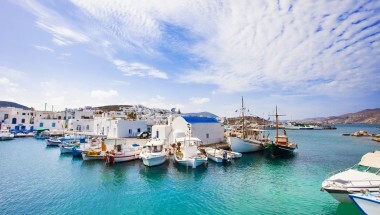 This luxury villa to rent on Paros is a beautiful white Cycladic home with swimming pool, situated in the north-east of the island and has direct access to the long sandy beach at Santa Maria, about 7 kms from the charming fishing village of Naoussa. The main town/port of Parikia is about 14 kms away. Entrance to the property is into a shaded parking area. A path leads to a spacious interior courtyard with a large built-in marble table, BBQ and an open-air shower. There is a guest house, accessed from the courtyard, with three single beds suitable for teenagers, with a bathroom with shower. This room is also connected to the ground floor of the main part of the house. The ground floor has an open-plan area with living room, office corner, TV area and a fireplace. Next to the living area is a separate dining area, and a kitchen, opening to two terraces, one to the rear and another front terrace with outdoor dining area. In front of the living area is another covered terrace. The master bedroom is also on this level, with wonderful sea views from the bed, an en-suite bathroom with large shower, and a veranda just outside the bedroom. The swimming pool is on the terrace here, next to the veranda. From the main courtyard, stairs lead up to the upper floor guesthouse, with one bedroom with king size bed and en-suite bathroom with shower, and a living area with 2 sofa beds There is a private veranda with panoramic view of the Aegean and Naxos Island on the distance. A separate entrance at the lower level of the house leads to the basement where there is a twin bedroom, an en-suite bathroom with shower, and a living area. 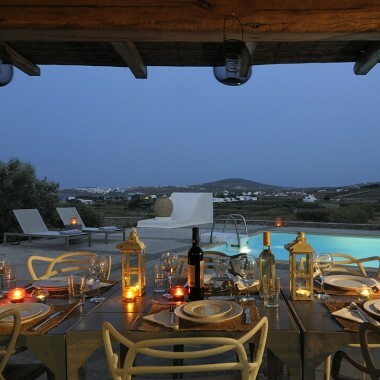 Amenities at this luxury villa to rent on Paros include satellite TV, DVD, Hi-Fi and Wi-Fi. The fully equipped kitchen includes a dishwasher, and a washing machine is available in a separate small laundry room and storage area. 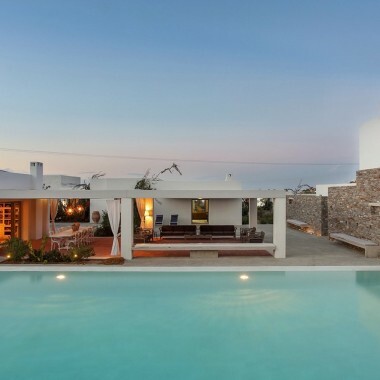 This luxury villa to rent on Paros is a white Cycladic building with large terraces, a swimming pool and direct access to beautiful sandy Santa Maria beach. 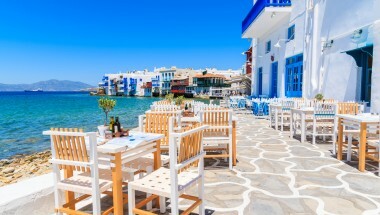 It is about 7 kms from the charming fishing village of Naoussa, and the main town and port of Parikia is about 14 kms away. Security deposit €1000 payable on arrival and returned at end of stay.